A Dana 60 front end is a nearly bulletproof design. 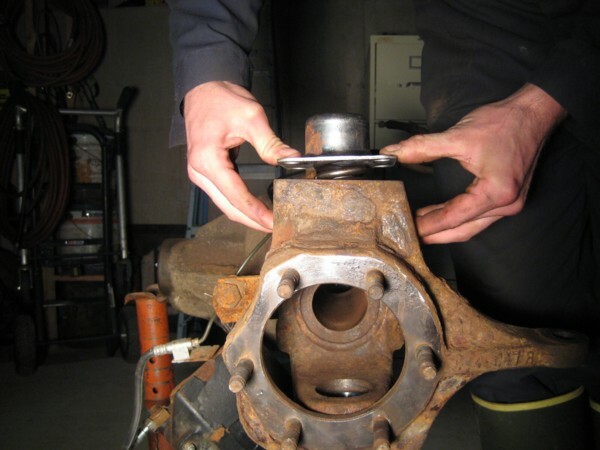 Inspections of axles on plow trucks that have over 250,000 miles on them, show only minor wear in the upper king pin bushing. The lower king pin on a Dana 60 utilizes a taper bearing with a corresponding race. 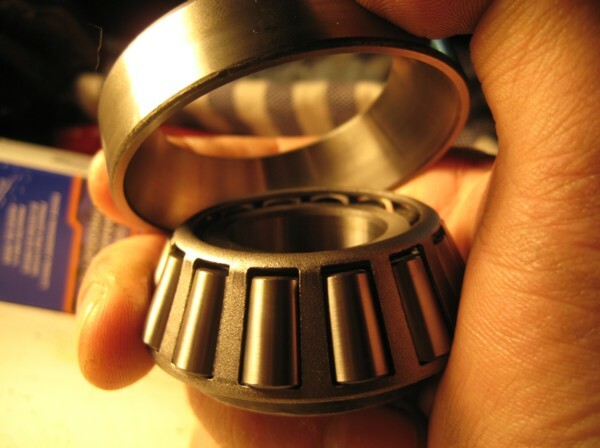 As long as the lower bearing is greased, it will never go bad. The upper king pin is a tapered stud that threads into the upper axle housing with a mating white plastic bushing that rotates with the steering knuckle. 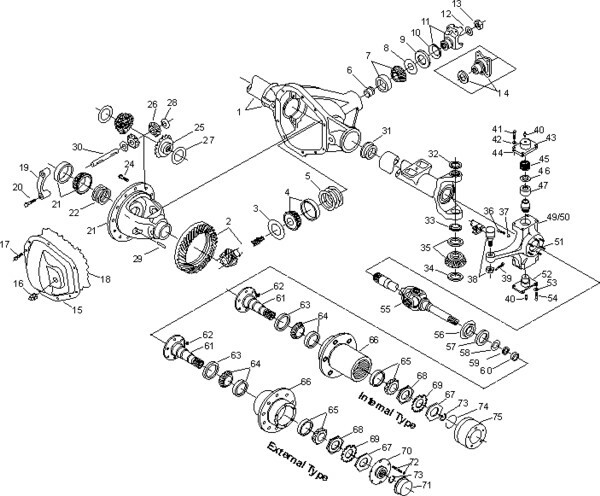 This assembly is tensioned by a heavy spring. Pictured above, this spring, when bolted down under the upper king pin cap, pulls the lower king pin bearing up against the lower axle tube housing while bearing directly on the upper kingpin bushing. 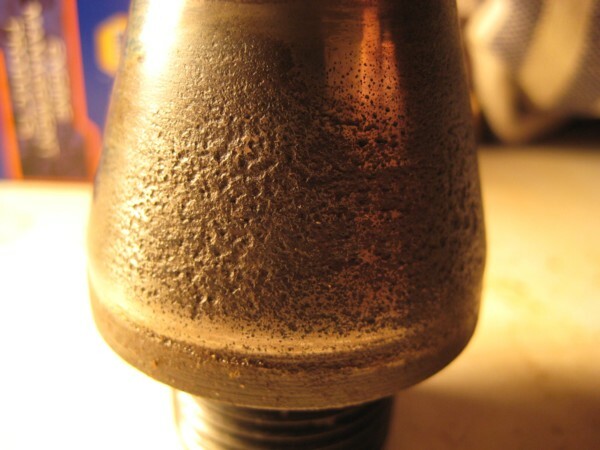 Even with significant wear, this design allows the system to maintain zero play by forcing the upper bushing farther down on the upper kingpin as it wears. 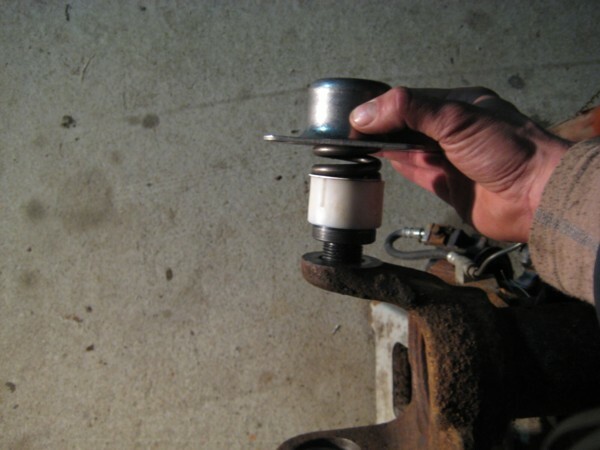 This eliminates the typical disadvantage posed with light duty ball joints used in the Dana 44. Dana 44 ball joints are a unitized press-in type with no large tension spring. This allows the steering knuckle to wobble as ball joints wear out, affecting steering heavily over bumps. In a Dana 60, heavy internal spring tension keeps everything tight, even as components wear. While this is a drivability advantage, it is not an advantage for tire wear. No play can be detected, even after considerable mileage and wear, so there is less incentive for an average owner to look into his steering geometry and replace components causing uneven tire wear. The common issue with a Dana sixty is negative camber, and on the higher mileage axles it can be quite obvious. Negative camber is a situation in which the top of the wheel tips in towards the centerline of the vehicle. It can often be spotted by simply walking from one side of the truck to the other, while looking at it from the front at some distance. Negative camber can provide some cornering advantages on cars with lower tire pressures. 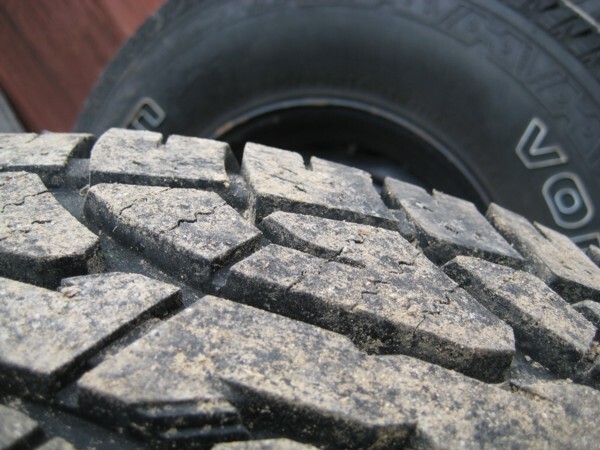 In a truck with tires inflated to 60 or 80 PSI, it reduces the footprint (road contact surface) of the tire and causes the inside of the tire to wear prematurely. This picture above is improper tire wear: Note the uneven shoulders or chop. This picture reflects proper tire wear: Note the shoulders are on an even plane. 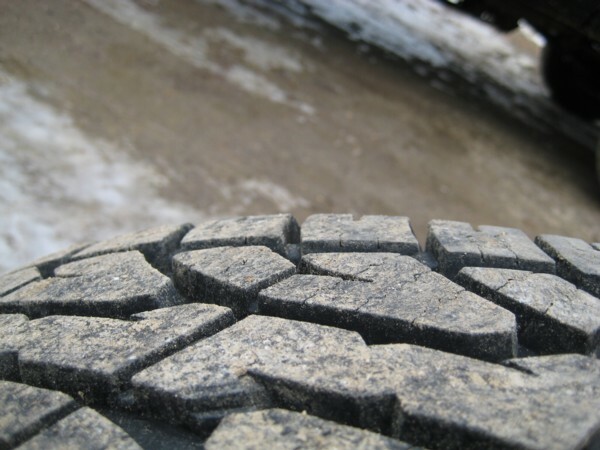 If increased vibration and tire noise is noticed, check for chopping or scalloping of the inner treads. Also note increased, but even wear on the insides of the tires. 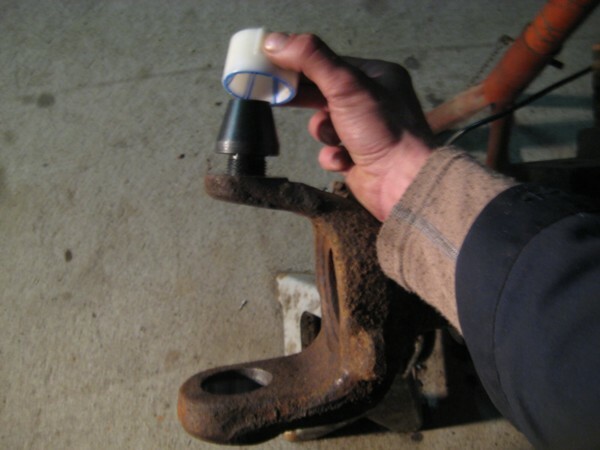 The solution might be as simple as replacing the upper king pin bushing. The upper bushings are plastic and are indexed in a slot, to keep them from rotating in relation to the steering knuckle. In the picture below, the grease grooves are worn completely through. 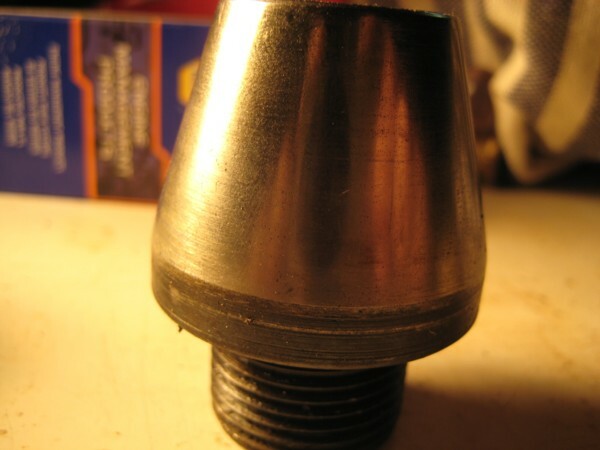 This bushing usually wears on the outboard side, causing the tires to wear on the inboard edge. The pitted kingpin pictured above (Spicer Part Number 37302) is a result of lack of grease. 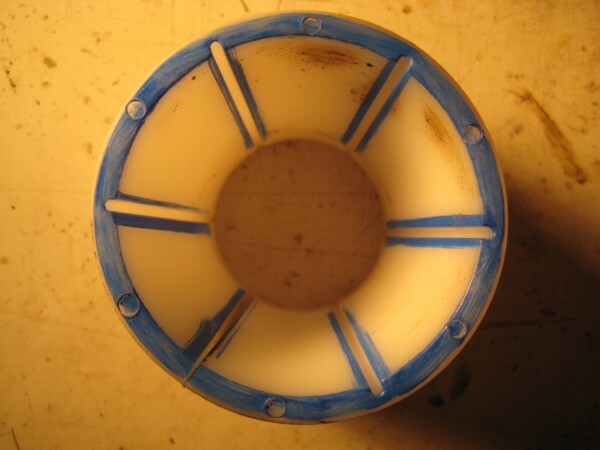 After the grooves wear out of the plastic bushing, grease is prevented from flowing to the critical portion of this kingpin face, accelerating wear and allowing corrosion pitting. Beware of only replacing the bushing during a rebuild. 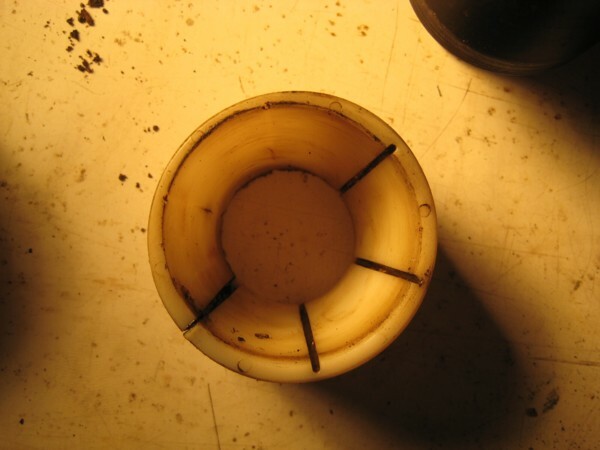 While a new bushing will allow grease to get to the pitted kingpin face; the bushing will be quickly worn out by the sharp edges of the corroded portion. If the kingpin looks like the one pictured below, it should not require replacement. When assessing kingpins, it is best to completely disassemble both sides. The two kingpins just pictured came off the same axle. Money can be saved by properly assessing both assemblies before buying unneeded replacement parts. Please remember, grease is your friend. Grease regularly to force out contaminants, and then grease again just for the heck of it. Dana 60 Kingpin Tech article written by Tyler Warnke. Copyright 2014. If you have any questions please contact Tyler at: beastmobile@hotmail.com This article is written for informational purposes only, any vehicle modifications made by readers of this article are their responsibility.